What do you do when you are done with a can of paint, but there is still paint left inside? Did you know that you can’t just throw it away? Ditto for that old tube TV and those garden thermometers. If you put these things in the trash, not only will you be harming the environment, but you’ll also be risking a fine or other penalties. 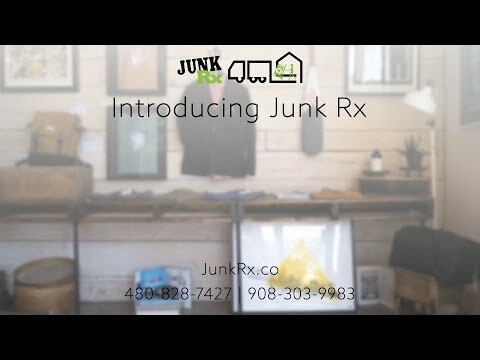 Whether you are moving into a new home that has been left littered by former tenants or you are just finally clearing out the work shed, you can call the junk removal specialists at Junk Rx to get rid of all the things you no longer want or need while also ensuring that you dispose of items properly. Our New Jersey junk removal specialists go in and separate the items that are to be recycled and prepare them appropriately. We put like items together to minimize the number of trips. Organizing items like this also ensures that no items are overlooked when making a drop-off at a recycling spot. Once items are separated, we ensure that everything is properly prepared, such as the harmful materials being removed. Some junk removers near New Jersey may claim to recycle your goods, but they end up dumping them in the landfill anyway (albeit illegally). Some may even dump them in the woods or along the side of the road. Not only does this result in further harm to the environment – and maybe even the water or soil supply that you use – but it can also lead to legal consequences for you. If authorities find that dumped waste, they will look for identifying information to determine who dumped it. If they find anything that leads back to you, you will be the one slapped with the fine, whether you hired someone else to do it or not. Our professional junk removal specialists in New Jersey always take your recyclable materials to the proper recycling or disposal centers. Your e-waste goes to e-cycling center. Your Freon goes to a center that accepts Freon. And so on. You never have to worry that your hazardous or recyclable materials will end up in a place that will cause further damage to the environment or that will land you in hot water. Proper recycling doesn’t just keep you out of trouble or help you feel better about being a good environmental citizen. It can also save you money! Sometimes, you can get money back for the items you recycle, such as junk metal that is taken to a scrap yard. If you have heavy iron, you can make quite a mint. Even more if you have copper! In some cases, we may even provide a discount on our services for some recyclable items. It depends on what is being recycled and how big the load is. So even if you don’t get money from the recycling center, we may provide you a discount, thereby putting money back in your pocket. Ultimately, recycling as much of your old junk as you can is just the right thing to do. But if you need even more incentive, the potential money savings or cash back, as well as avoiding penalty, should be enough to make you want to recycle as much as you can. Let the junk removal specialists at Junk Rx help you! We serve residential and commercial clients throughout the Washington, NJ area. We have references from many satisfied clients, and we have a well-deserved reputation for our top-notch service and fast results. Let us clear your property of unneeded junk and give you the peace of mind of knowing that it is going to the right recycling or disposal centers. Call us today to get an estimate!